The Whale Run is brought to you by Kaikōura Suburban School where kids get an education they will remember for life. This is our biggie for the serious runners, walkers and self-challenge doers. Course heads off down to the Kowhai River bank through nice bird-filled bush, back along Postmans Road, a wee climb towards the end with the treat of great views across the Kaikōura Peninsula. We follow the same track as the 1/2 Marathon for a start on this course. Not quite so much Kowhai River bank and a nice return loop along the flats. Great for folk who don’t do hills….. But don’t be fooled, it’s still a challenge! This race is exclusively for primary school age children (9 years and under). Parents would never keep up anyhow! A sprint down Schoolhouse Road to the Suburban Hall and return. Keep your eyes open if you want to catch this race, it’s quick. Now into it's 13th year, the Kaikōura Whale Run began life in the school grounds of Kaikōura Suburban School as the Kaikōura Suburban Half Marathon. The idea was to create a fun event fund raiser that could encourage folk to have a get fit project over winter to feel great for the summer. It has proven to be very popular and thanks to the support and sponsorship of local businesses and you; the competitors, we bring you the bigger and even better Kaikōura Whale Run. The team loved your event last year and I would love to get up and participate in something this year. I just want to congratulate and thank you. Congratulations for organising such a successful running event. All of the students I have talked to really enjoyed it as did our Principal. Our students felt a real sense of accomplishment at finishing the race. Thanks again for a wonderful event. Am happy to promote to all my running friends. A big thank you for the prize. It was unexpected and very generous. 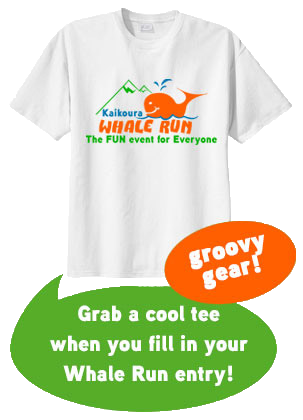 Thank you for an amazing event, I'll be sharing with all my friends how great the Kaikoura Whale Run is!!! Great event. Will be back next year, thanks! I love running with Harold the Giraffe. Lovely brisk stroll the dappled wattle tree lanes, with picturesque snow-capped peaks in the background - superb! Started great, finished sore, happy with time! May it continue, love Whale run each year.